Left community · Posted in Problème de MAJ v3.0.4 > v3.1.8 ? Essaies `cmd+.`(cltr+. sur windows), ca devrait ouvrir la console, est-ce qu'il y a des erreurs la dedans? Hold "shift + drag", to move a stroke. Hold "alt + drag" to move a whole layer. I've looked all over to make a PR for this one, but I cannot find the sources for the website. So here's something that has been bugging me for a little while. Could the spacing in the widget be fixed so the overall padding is 10px, instead of 4px, 6px and 10px? Illustrator doesn't support the full scope of SVG used in Dotgrid. Usually it tends to happen when straight lines are drawn using the arc tool. It's possible. Where did you see ctrl+p for resolution? That sounds like from the old versions. Just replace this file with a similarly formatted collection of Polish words. Could you rename this thread to something to the order of `Support Inkscape SVG specs `. Can you remove segments from the dotgrid file until you can isolate which part is not supported by Inkscape? We do not have Inkscape to test, but if you tell me which part of the SVG specs that Inkscape does not understand, we can try to fix it. Fixed :) You should be getting an automatic update through the itch client. Paradise community · Replied to ElliottB1 in Web on the horizon? Uncanny, are you watching the repo? I'm actually working on that RIGHT NOW. Spending quite a bit of time answering questions and replies, one thing that as been on my mind lately, is the difference between various types of replies and their colors. On one side, there's a reply(red Link toward the thread, grey link toward the message), an as for new topic(red link toward the forum, grey link toward the thread). I would use this instead. Red is what, grey is where. I personally never use the View Post button, since it doesn't really show it in context, I'd rather have the red reply link send me to the reply through a html hash. But if that View Post feature is important, maybe something like "leafo posted a reply in your topic Display Updated date", woul allow for both. 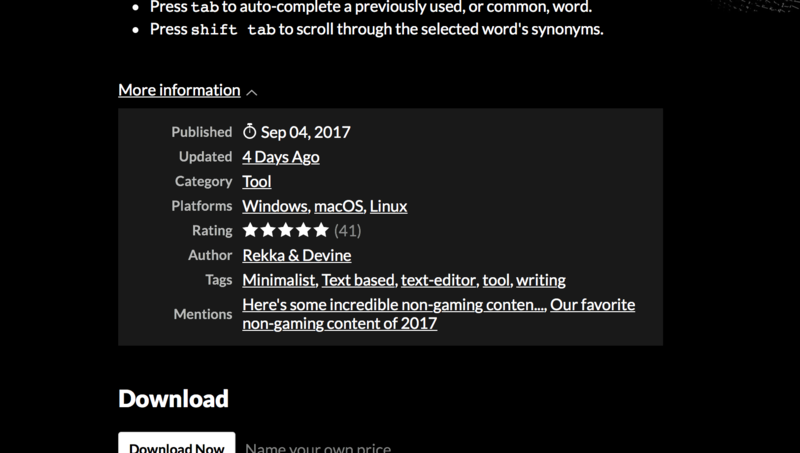 itch.io Community » itch.io » Questions, Ideas & Feedback · Replied to leafo in Display Updated date in the "More Information" dropdown. Actually, in this case, it wasn't for me(I use the devlog sometimes), I found myself browsing someone's project, and it seemed utterly dead, I looked at the more info and could only see the release date(a few years ago), this person didn't use the devlogs I guess. And didn't use the community feature, so it seemed like the project was sort of abandoned? I asked them when was the last build made and it was just last week! I figured that this should have been something I could have seen there. It could be any activity at all(changed the page's style, added screenshots, change the name of a file, etcc), it doesn't have to be just devlogs. itch.io Community » itch.io » Questions, Ideas & Feedback · Created a new topic Display Updated date in the "More Information" dropdown. Bizarre :/ As tu regarde avec la console si ca te donne des erreurs pendant les lags? Left community · Posted in Disable opening the untitiled manual when opening the editor? Left community · Posted in Quick Inserts doesn't seem to work with Mac Version? On OSX, you can quickly insert or transform text by activating the Insert Mode with cmd+i, followed by cmd+d, for the date, for example. Left community · Posted in Zoom In or Change Font Size in Mac Version? Left community · Posted in File Saved As? Left only saves as flat files. So you decide which extension you like wether it be .txt, .md, .log, .html or others. Keep it up, I'm looking forward to see more! To set a color to the active layer, you can open the color picker with ctrl+p, as described in the guide — And type an hexadecimal color code.